Narcissistic Personality Disorder and Schizoid Personality Disorder share the same aetiology, psychodynamics, traits (such as grandiosity) and behavior patterns. Some narcissists are not gregarious. They avoid social events and are stay-at-home recluses. Doesn't this behaviour go against the grain of narcissism? Click here to read the definition of the Schizoid Personality Disorder (SPD) in the DSM-IV-TR . Click here to read a description of the Schizoid Personality Disorder (SPD) and some treatment notes. "The person with Schizoid Personality Disorder sustains a fragile emotional equilibrium by avoiding intimate personal contact and thereby minimising conflict that is poorly tolerated." Schizoids are often described, even by their nearest and dearest, in terms of automata ("robots"). They are uninterested in social relationships or interactions and have a very limited emotional repertoire. It is not that they do not have emotions, but they express them poorly and intermittently. They appear cold and stunted, flat, and "zombie"-like. Consequently, these people are loners. They confide only in first-degree relatives, but maintain no close bonds or associations, not even with their immediate family. Naturally, they gravitate into solitary activities and find solace and safety in being constantly alone. Their sexual experiences are sporadic and limited and, finally, they cease altogether. Schizoids are anhedonic - find nothing pleasurable and attractive - but not necessarily dysphoric (sad or depressed). Some schizoid are asexual and resemble the cerebral narcissist. They pretend to be indifferent to praise, criticism, disagreement, and corrective advice (though, deep inside, they are not). They are creatures of habit, frequently succumbing to rigid, predictable, and narrowly restricted routines. Intuitively, a connection between SPD and the Narcissistic Personality Disorder (NPD) seems plausible. After all, narcissists are people who self-sufficiently withdraw from others. They love themselves in lieu of loving others. Lacking empathy, they regard others as mere instruments, objectified "Sources" of Narcissistic Supply. The inverted narcissist (IN) is a narcissist who "projects" his narcissism onto another narcissist. The mechanism of projective identification allows the IN to experience his own narcissism vicariously, through the agency of a classic narcissist. But the IN is no less a narcissist than the classical one. He is no less socially reclusive. A distinction must be made between social interactions and social relationships. The schizoid, the narcissist and the inverted narcissist – all interact socially. But they fail to form human and social relationships (bonds). The schizoid is uninterested and the narcissist is both uninterested and incapable to due to his lack of empathy and pervasive sense of grandiosity. The psychologist H. Deutsch first suggested the construct of "as-if personality" in the context of schizoid patients (in an article, published in 1942 and titled "Some forms of emotional disturbance and their relationship to schizophrenia"). A decade later, Winnicott named the very same idea as the "False-self Personality". The False Self has thus been established as the driving engine of both pathological narcissism and pathological schizoid states. Both C. R. Cloninger and N. McWilliams (in "Psychoanalytic Diagnosis", 1994) observed the "faintly contemptuous (attitude) ... (and) isolated superiority" of the schizoid - clearly narcissistic traits. The ethno-psychologist George Devereux [Basic Problems of Ethno-Psychiatry, University of Chicago Press, 1980] proposed to divide the unconscious into the Id (the part that is instinctual and unconscious) and the "ethnic unconscious" (repressed material that was once conscious). The latter includes all the defence mechanisms and most of the Superego. Culture dictates what is to be repressed. Mental illness is either idiosyncratic (cultural directives are not followed and the individual is unique, eccentric, and schizophrenic) – or conformist, abiding by the cultural dictates of what is allowed and disallowed. Our culture, according to Christopher Lasch, teaches us to withdraw inwards when confronted with stressful situations. It is a vicious circle. One of the main stressors of modern society is alienation and a pervasive sense of isolation. The solution our culture offers – to further withdraw – only exacerbates the problem. Richard Sennett expounded on this theme in "The Fall of Public Man: On the Social Psychology of Capitalism" [Vintage Books, 1978]. One of the chapters in Devereux's aforementioned tome is entitled "Schizophrenia: An Ethnic Psychosis, or Schizophrenia without Tears". To him, the United States is afflicted by what came later to be called a "schizoid disorder". The first to seriously consider the similarity, if not outright identity, between the schizoid and the narcissistic disorders was Melanie Klein. She broke ranks with Freud in that she believed that we are born with a fragile, brittle, weak and unintegrated Ego. The most primordial human fear is the fear of disintegration (death), according to Klein. Thus, the infant is forced to employ primitive defence mechanisms such as splitting, projection and introjection to cope with this fear (actually, with the result of aggression generated by the Ego). The Ego splits and projects this part (death, disintegration, aggression). It does the same with the life-related, constructive, integrative part of itself. As a result of all these mechanics, the infant views the world as either "good" (satisfying, complying, responding, gratifying) – or bad (frustrating). Klein called it the good and the bad "breasts". The child then proceeds to introject (internalise and assimilate) the good object while keeping out (defending against) the bad objects. The good object becomes the nucleus of the forming Ego. The bad object is felt as fragmented. But it has not vanished, it is there. The fact that the bad object is "out there", persecutory, threatening – gives rise to the first schizoid defence mechanisms, foremost amongst them the mechanism of "projective identification" (so often employed by narcissists). The infant projects parts of himself (his organs, his behaviours, his traits) unto the bad object. This is the famous Kleinian "paranoid-schizoid position". The Ego is split. This is as terrifying as it sounds but it allows the baby to make a clear distinction between the "good object" (inside him) and the "bad object" (out there, split from him). If this phase is not transcended the individual develops schizophrenia and a fragmentation of the self. Around the third or fourth month of life, the infant realises that the good and the bad objects are really facets of one and the same object. He develops the depressive position. This depression [Klein believes that the two positions continue throughout life] is a reaction of fear and anxiety. The infant feels guilty (at his own rage) and anxious (lest his aggression harms the object and eliminates the source of good things). He experiences the loss of his own omnipotence since the object is now outside his self. The infant wishes to erase the results of his own aggression by "making the object whole again". By recognising the wholeness of other objects, the infant comes to realise and to experience his own wholeness. The Ego re-integrates. But the transition from the paranoid-schizoid position to the depressive one is by no means smooth and assured. Excess anxiety and envy can delay it or prevent it altogether. Envy seeks to destroy all good objects, so that others don't have them. It, therefore, hinders the split between the good and the bad "breasts". Envy destroys the good object but leaves the persecutory, bad object intact. Moreover, envy does not allow re-integration ["reparation" in Kleinian jargon] to take place. The more whole the object – the greater the destructive envy. Thus, envy feeds on its own outcomes. The more envy, the less integrated the Ego is, the weaker and more inadequate it is – and the more reason for envying the good object and other people. Both the narcissist and the schizoid are examples of development arrested due to envy and other transformations of aggression. Envy is the hallmark of narcissism and the prime source of what is known as narcissistic rage. The schizoid self – fragmented, weak, primitive – is intimately connected with narcissism through envy. Narcissists prefer to destroy themselves and to deny themselves rather than endure someone else's happiness, wholeness and "triumph". The narcissist fail his exams in order to frustrate the teacher he adores and envies. He aborts his therapy in order not to give the therapist a reason to feel gratified. By self-defeating and self-destructing, narcissists deny the worth of others. If the narcissist fails in therapy – his analyst must be inept. If he destroys himself by consuming drugs – his parents are blameworthy and should feel guilty and bad. One cannot exaggerate the importance of envy as a motivating power in the narcissist's life. The psychodynamic connection is obvious. Envy is a rage reaction to not controlling or "having" or engulfing the good, desired object. Narcissists defend themselves against this acidulous, corroding sensation by pretending that they do control, possess and engulf the good object. This are the narcissist's "grandiose fantasies (of omnipotence or omniscience)". But, in doing so, the narcissist must deny the existence of any good outside himself. The narcissist defends himself against raging, all consuming envy – by solipsistically claiming to be the only good object in the world. This is an object that cannot be had by anyone, except the narcissist and, therefore, is immune to the narcissist's threatening, annihilating envy. In order to refrain from being "owned" by anyone (and, thus, avoid self-destruction in the hands of his own envy), the narcissist reduces others to "non-entities" (the narcissistic solution), or completely avoids all meaningful contact with them (the schizoid solution). The suppression of envy is at the core of the narcissist's being. If he fails to convince his self that he is the only good object in the universe, he is bound to be exposed to his own murderous envy. If there are others out there who are better than him, he envies them, he lashes out at them ferociously, uncontrollably, madly, hatefully and spitefully, he tries to eliminate them. If someone tries to get emotionally intimate with the narcissist, she threatens the grandiose belief that no one but the narcissist can possess the good object (that is the narcissist himself). Only the narcissist can own himself, have access to himself, possess himself. This is the only way to avoid seething envy and certain self-annihilation. Perhaps it is clearer now why narcissists react as raving madmen to anything, however minute, however remote that seems to threaten their grandiose fantasies, the only protective barrier between themselves and their lethal, seething envy. There is nothing new in trying to link narcissism to schizophrenia. Freud did as much in his "On Narcissism" . Klein's contribution was the introduction of immediately post-natal internal objects. Schizophrenia, she proposed, was a narcissistic and intense relationship with internal objects (such as fantasies or images, including fantasies of grandeur). She proposed a new language. Freud suggested a transition from (primary, object-less) narcissism (self-directed libido) to objects relations (objects directed libido). Klein suggested a transition from internal objects to external ones. While Freud thought that the denominator common to narcissism and schizoid phenomena is a withdrawal of libido from the world – Klein suggested it was a fixation on an early phase of relating to internal objects. But is the difference not merely semantic? "The term 'narcissism' tends to be employed diagnostically by those proclaiming loyalty to the drive model [Otto Kernberg and Edith Jacobson, for instance – SV] and mixed model theorists [Kohut], who are interested in preserving a tie to drive theory. 'Schizoid' tends to be employed diagnostically by adherents of relational models [Fairbairn, Guntrip], who are interested in articulating their break with drive theory… These two differing diagnoses and accompanying formulations are applied to patients who are essentially similar, by theorists who start with very different conceptual premises and ideological affiliations." Klein, in effect, said that drives (e.g., the libido) are relational flows. A drive is the mode of relationship between an individual and his objects (internal and external). Thus, a retreat from the world [Freud] into internal objects [as postulated by object relations theorists and especially the British school of Fairbairn and Guntrip] – is the drive itself. Drives are orientations (to external or internal objects). Narcissism is an orientation (a preference, we could say) towards internal objects – the very definition of schizoid phenomena as well. This is why narcissists feel empty, fragmented, "unreal", and diffuse. It is because their Ego is still split (never integrated) and because they had withdrawn from the world (of external objects). Kernberg identifies these internal objects with which the narcissist maintains a special relationship with the idealised, grandiose images of the narcissist's parents. 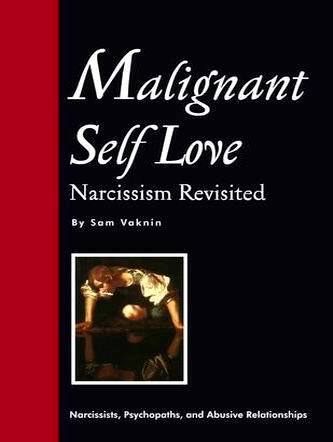 He believes that the narcissist's very Ego (self-representation) had fused with these parental images. Fairbairn's work – even more than Kernberg's, not to mention Kohut's – integrates all these insights into a coherent framework. Guntrip elaborated on it and together they created one of the most impressive theoretical bodies in the history of psychology. Fairbairn internalised Klein's insights that drives are object-orientated and their goal is the formation of relationships and not primarily the attainment of pleasure. Pleasurable sensations are the means to achieve relationships. The Ego does not seek to be stimulated and pleased but to find the right, "good", supporting object. The infant is fused with his Primary Object, the mother. Life is not about using objects for pleasure under the supervision of the Ego and Superego, as Freud suggested. Life is about separating, differentiating, individuating, and achieving independence from the Primary Object and the initial state of fusion with it. Dependence on internal objects is narcissism. Freud's post-narcissistic (anaclitic) phase of life can be either dependent (immature) or mature. The newborn's Ego is looking for objects with which to form relationships. Inevitably, some of these objects and some of these relationships frustrate the infant and disappoint him. He compensates for these setbacks by creating compensatory internal objects. The initially unitary Ego thus fragments into a growing group of internal objects. Reality breaks our hearts and minds, according to Fairbairn. The Ego and its objects are "twinned" and the Ego is split in three [or four, according to Guntrip, who introduced a fourth Ego]. A schizoid state ensues. The "original" (Freudian or libidinal) Ego is unitary, instinctual, needy and object seeking. It then fragments as a result of the three typical interactions with the mother (gratification, disappointment and deprivation). The central Ego idealises the "good" parents. It is conformist and obedient. The antilibidinal Ego is a reaction to frustrations. It is rejecting, harsh, unsatisfying, dead set against one's natural needs. The libidinal Ego is the seat of cravings, desires and needs. It is active in that it keeps seeking objects to form relationships with. Guntrip added the regressed Ego, which is the True Self in "cold storage", the "lost heart of the personal self". Fairbairn's definition of psychopathology is quantitative. How much of the Ego is dedicated to relationships with internal objects rather than with external ones (e.g., real people)? In other words: how fragmented (how schizoid) is the Ego? To achieve a successful transition from focusing on internal objects to seeking external ones, the child needs to have the right parents (in Winnicott's parlance, the "good enough mother" – not perfect, but "good enough"). The child internalises the bad aspects of his parents in the form of internal, bad objects and then proceeds to suppress them, together ("twinned") with portions of his Ego. Thus, his parents become a part of the child (though a repressed part). The more bad objects are repressed, the "less Ego is left" for healthy relationships with external objects. To Fairbairn, the source of all psychological disturbances is in these schizoid phenomena. Later developments (such as the Oedipus Complex) are less crucial. Fairbairn and Guntrip think that if a person is too attached to his compensatory internal objects – he finds it hard to mature psychologically. Maturing is about letting go of internal objects. Some people just don't want to mature, or are reluctant to do so, or are ambivalent about it. This reluctance, this withdrawal to an internal world of representations, internal objects and broken Ego – is narcissism itself. Narcissists simply don't know how to be themselves, how to be and act independent while managing their relationships with other people. Both Otto Kernberg and Franz Kohut contended that narcissism is somewhere between neurosis and psychosis. Kernberg thought that it was a borderline phenomenon, on the verge of psychosis (where the Ego is completely shattered). In this respect Kernberg, more than Kohut, identifies narcissism with schizoid phenomena and with schizophrenia. This is not the only difference between them. They also disagree on the developmental locus of narcissism. Kohut thinks that narcissism is an early phase of development, fossilised, and doomed to be repeated (a repetition complex) while Kernberg maintains that the narcissistic self is pathological from its very inception. Kohut believes that the narcissist's parents failed to provide him with assurances that he does possess a self (in his words, they failed to endow him with a self-object). They did not explicitly recognise the child's nascent self, its separate existence, and its boundaries. The child learned to have a schizoid, split, fragmented self, rather than a coherent ad integrated one. To Kohut, narcissism is really all-pervasive, at the very core of being (whether in its mature form, as self-love, or in it regressive, infantile form as a narcissistic disorder). Kernberg regards "mature narcissism" (also espoused by neo-Freudians like Grunberger and Chasseguet-Smirgel) as a contradiction in terms, an oxymoron. He observes that narcissists are already grandiose and schizoid (detached, cold, aloof, asocial) at an early age (when they are three years old, according to him!). Like Klein, Kernberg believes that narcissism is a last ditch effort (defence) to halt the emergence of the paranoid-schizoid position described by Klein. In an adult such an emergence is known as "psychosis" and this is why Kernberg classifies narcissists as borderline (almost) psychotics. Even Kohut, who is an opponent of Kernberg's classification, uses Eugene O'Neill's famous sentence [in "The Great God Brown"]: "Man is born broken. He lives by mending. The grace of God is glue." Kernberg himself sees a clear connection between schizoid phenomena (such as alienation in modern society and subsequent withdrawal) and narcissistic phenomena (inability to form relationships or to make commitments or to empathise). The narcissist’s False Self requires constant dollops of narcissistic supply (attention.) The narcissist’s sense of entitlement and innate superiority collide painfully with his unmitigated dependence on other people for the regulation of his labile sense of self-worth and the maintenance of his grandiose fantasies. Narcissists who are also psychopaths (antisocial) or schizoids choose to avoid the constant hurt and injuries entailed by this conflict by withdrawing from society – physically as well as psychologically - into a cocoon of self-delusion, confabulated narratives, and vivid dreams of triumph and revenge. They become “lone wolf” narcissists and prey on society at large by indiscriminately victimizing, abusing, and attacking any of person unfortunate enough to cross their path. Inevitably, the lone wolf narcissist is in a constant state of deficient narcissistic supply, very much like a junkie deprived of access to his drug of choice. This overwhelming, unquenched, vampiric hunger coupled with an almost-psychotic state render the lone wolf narcissist dangerous to others. His aggression often turns to outright violence; his frustration to vindictive rage; his addiction to narcissistic supply drives him to coerce people – often randomly selected – to serve as sources of adulation, affirmation, and support; his detachment evolves into a loss of touch with reality, cognitive deficits, and utter misjudgement of his environment and milieu; he seeks fame and celebrity by all means available to him, even by resorting to crime and terrorism.